There will always be scary predator eyes looking out at us from the bushes – it’s just that most of the time they are mounted on the rear end of a happily munching caterpillar. On a walk at Yates Mill Park the other day, I came across one of my favorite caterpillars. My first glimpse was of a darkened blob on a leaf as I walked past a fence. The leaf was on a climbing vine of a Greenbriar, Smilax rotundifolia. 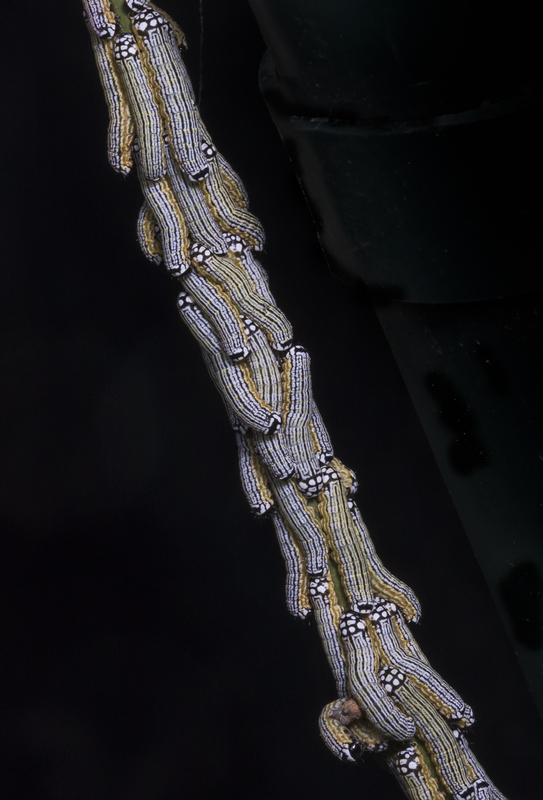 When I stepped closer, I knew what the blob was…a group of tightly packed caterpillars! These striking larvae go by the unusual name of Turbulent Phosphila, Phosphila turbulenta. I discussed this species in an earlier post and am always delighted to find them. The name intrigues me…I understand the turbulent (characterized by conflict, disorder, or confusion) part…they are gregarious feeders in their early stages and can appear quite confusing when seen in a mass on the underside of a Smilax leaf (their only host plant). Sam Jaffe, an incredible photographer and educator on the subject of caterpillars, described them as looking like a mass appearing more like some strange outdoor QR code than biological life. Well said, Sam. It is the Phosphila part that has me baffled. If you break it down into its Greek roots, it means “phos” = Light, and “phila” = loving….light loving. These guys usually hide on the underside of leaves as larvae or are clustered along a stem, hardly the behavior of a light-lover. Perhaps the adult moth is especially attracted to light? I don’t know. Perhaps the bright white spots on the rear of the caterpillar resemble bright points of light to someone? Not sure. Those spots are believed to function as fake eyes, and are more prominent and numerous than the eye spots on the anterior end of this species, making it tough to tell which end is which. Whether the fake eye spots on the rear create a distraction for would-be predators away from the more vital head portion of the caterpillar, or they just serve as a startle and potential threat factor when seen in a grouping, the impact is one of confusion when you first look at these larvae. 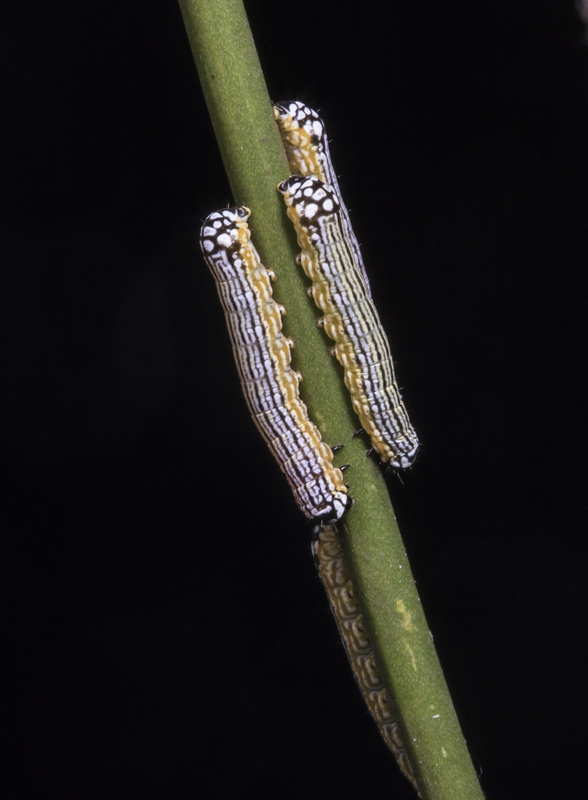 David Wagner, in his excellent reference, Caterpillars of Eastern North America, states that both the coloration and behavior suggest that these caterpillars are chemically protected. Whatever the case, they provide me with a wonderful visual treat every time I encounter them. This entry was posted in Natural History and tagged caterpillar defenses, false eyespots, turbulent phosphila by roadsendnaturalist. Bookmark the permalink. Thank you for these great pics and info. It doesn’t matter how old I get, I still seems to get pleasure out of watching caterpillars. The whole process of metamorphosis is so fascinating as is the different forms of protection the caterpillars use. Here in my garden I find orchard swallowtail larvae. The pink protrusions that come out from their head when disturbed are rather striking. Thanks, Jane. I agree, caterpillars are definitely one of my favorite groups of critters and a great way to engage the public in nature-watching. Very cool about the pink osmeteria on your swallowtails…all of our local species have orange ones.